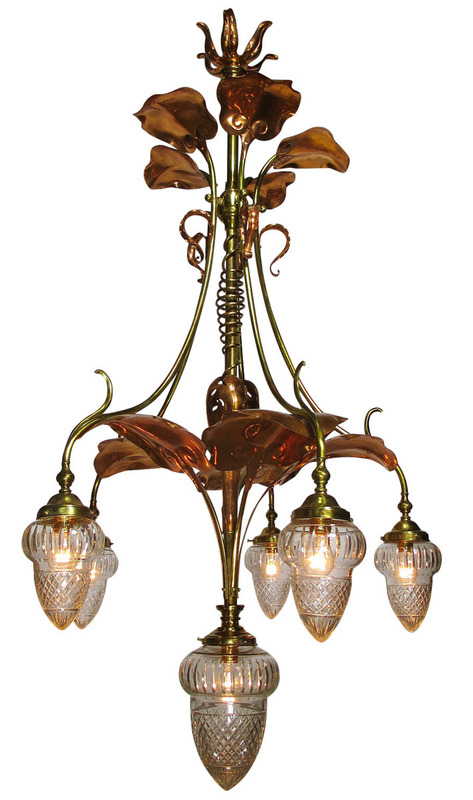 A Large Fine and Rare English Art-Nouveau Arts and Crafts Movement, Brass and Copper Six-Light Chandelier, the central support pole having a spiraling brass ornament surmounted with applied copper lily pad leaves, with six brass drop-lights with molded cut-glass shades, Probably by William Arthur Smith Benson (W.A.S. Benson) Unmarked and Unsigned. Circa 1900. William Arthur Smith Benson (English, 1854-1924) was a leader of the British Arts and Crafts movement. Although he trained as an architect, Benson took up metalwork at the suggestion of Edward Burne-Jones and William Morris. 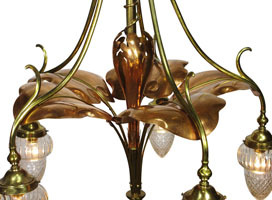 Benson’s light fittings became models for other Arts and Crafts metalwork innovative lighting designs for both candles and electric light. 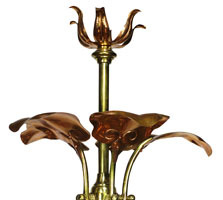 Early in his career, Benson focused predominantly on handcrafted objects and candle lighting. In 1881, he hired the brass and copper worker, John Lovegrove, who contributed great experience and skill and with whom Benson collaborated for many years. Benson’s workshop succeeded in mixing hand and machine production by maintaining an honesty of construction and a high quality of workmanship and design. Benson was also an active advocate for his field. He became a founding member the Art Workers’ Guild in 1884, which brought together progressive architects, designers, and craftsmen, and also helped to establish the Arts and Crafts Exhibition Society in 1887 to address the lack of exhibitions for decorative art in Britain. 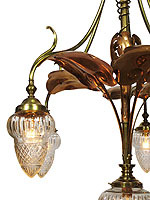 The Arts and Crafts movement was an international movement in the decorative and fine arts that began in Britain and flourished in Europe and North America between 1880 and 1910, emerging in Japan in the 1920's. It stood for traditional craftsmanship using simple forms, and often used medieval, romantic, or folk styles of decoration. It advocated economic and social reform and was essentially anti-industrial. It had a strong influence on the arts in Europe until it was displaced by Modernism in the 1930's, and its influence continued among craft makers, designers, and town planners long afterwards. 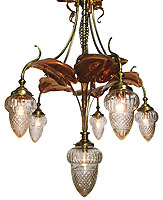 The term was first used by T. J. Cobden-Sanderson at a meeting of the Arts and Crafts Exhibition Society in 1887, although the principles and style on which it was based had been developing in England for at least twenty years. It was inspired by the writings of architect Augustus Pugin (1812–1852), writer John Ruskin (1819–1900), and artist William Morris (1834–1896). The movement developed earliest and most fully in the British Isles, and spread across the British Empire and to the rest of Europe and North America. It was largely a reaction against the perceived impoverished state of the decorative arts at the time, and the conditions in which they were produced.